From the multi-material façade to the flared porch column and exposed rafter tails, this ranch home plan exudes Craftsman styling lending stunning curb appeal. Beyond the covered front porch, you’ll find a floor plan flexible enough for a growing family and suitable for retired couples who enjoy entertaining and look forward to the kids and grandkids coming home for the holidays. To the left of the entry, stylish columns define the formal dining room while maintaining openness with the great room. Together, these two spaces create an entertainment area for special occasions. The great room showcases a central fireplace flanked with windows and a vaulted ceiling which continues over the breakfast nook and kitchen adding a sense of spaciousness. Special appointments pleasing the chef include a cooking island with snack bar and built-in menu desk. And for the grill master, double doors open to the rear deck offering a great place to fire up the grill. You’ll also appreciate this outdoor living space for conversation and just plain relaxing with family and friends. The laundry room and 2-car garage complete the left side of the home. Reserved for peace and quiet, the right side of the home holds your master suite and the cozy den, which easily converts to an extra bedroom when company arrives. Fine appointments will pamper you at the end of the day in your private retreat. Notice the vaulted ceiling, private deck access and refreshing salon bath. The finished lower level provides room for the kids or grandkids to roam in the comfortable recreation room. Don’t miss access to the outdoors. The walkout basement design makes this home suitable for a sloping lot. Bedrooms 3 and 4 share a full bath. Now take a look at the bonus room. It is waiting for your creative touch and could easily be used as a sewing room, exercise area or something else you might desire. Designed for flexibility, this Craftsman house plan is sure to appeal to a broad range of home buyers. 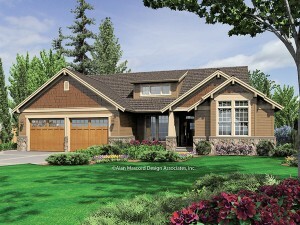 To view more home plans like this one, check out our Craftsman home plan collection. While Craftsman home plans can be as small as a cottage or an impressive luxury home, they all display as least some of the features characteristics mentioned above. They are closely related to Northwestern style designs and bungalows. 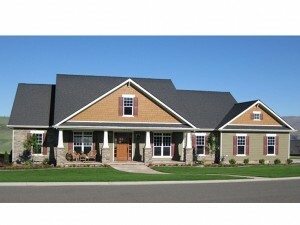 Browse our collection of Craftsman house plans now.